giving alms for nuns and monks, the offerings are usually rice, soup, rice cakes (mochi　餅) or nuts and sweet cakes. Rice is usually freshly cooked or in form of rice gruel. Soup should be sweetened or contain beans. The offering in form of the fruits from trees, the nuts, is an old habit in Buddhist food offerings. The bowls used for these offerings have their origin in the normal food containers. These bowls are used to offer the food on the altar in front of a Buddha statue. In the beginning, the begging bowls where put there on a special tray. In esoteric Buddhism, two bowls where offered as a pair, usually in the same decoration as the other ritual items on the altar. These bowls are also used in the private home altar. They have a high foot (takatsuki, koshidaka, koodai). They are sparcely decorated, sometimes just a band of lotus flowers or Chinese arabesques. At the bottom of the foot there can be eight lotusflowers showing toward the ground. Gold, iron or other metals. Their origin is in the normal bowls used by monks and nuns on their daily round of begging (takuhatsu) in India. Nowadays in Japan we can still see the monks on certain days walking through a neighbourhood, chanting their sutras in front of the door and waiting for an offering (usually money these days). The begging bowl is a symobl of the vow of non-possession. Apart from the cloths it was the only personal belonging of a monk or pilgrim. A round bowl, the shoulder a little wider than the opening. It is carried in a kind of scarf (hatsufuku, hattai, hatsunoo), which the monk has around his shoulder during the begging walk. Sometimes the bowl is covered by a special cover (hachigai), to keep the food clean. Usually iron or simple pottery (gahatsu), usually green, red and blue. Other colors were not allowed. 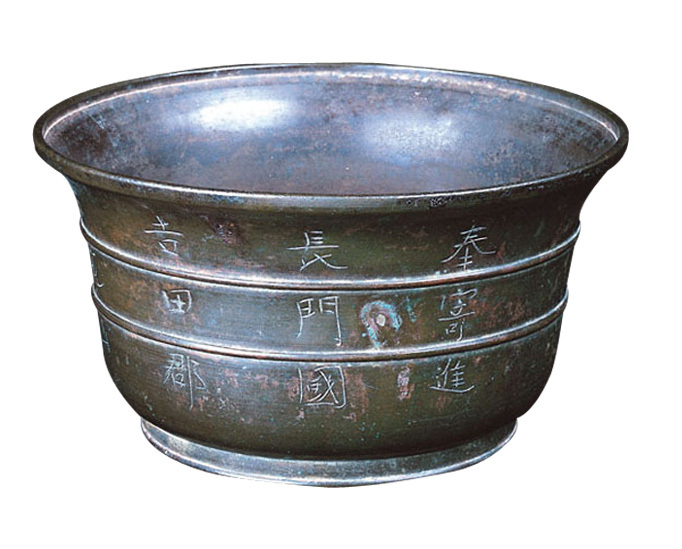 According to Hamada the following materials should NOT be used for begging bowls, since they do not agree with a monk's vow of poverty: bronze, silver, wood, dry laquer (kanshitsu 乾漆) and stone. The four heavenly gods (shitennoo) wanted to present Shakyamuni with four golden begging bowls, but he refused. He also refused to take bowls with emaille covering. Finally they brought him simpel bowls of stone which he accepted, but miraculously changed into one so that none of the gods would be offended. He simply put the four bowls one into each other and held his hand above them, so they changed into one. Nowadays a begging bowl should be of a simple material. The one on the picture are of simple laquer, with spoon, chopsticks and chopstsick-holder for the daily use in a Zen temple. Monks also use four or six bowls, one smaller then the next to hold each other, sometimes even eight bowls are used (yae mari 八重鋺）. The smallest one is called "Eating Bowl" (kenshi, kenji, kunsu) in the Zen sect. They can also be used to measure rice and beans. These bowls are often seen in Northern Japan in temples of the mountain ascetics (yamabushi). They are used to hold offerings or to wash rice. Sometimes they are small buckets with three feet or a high foot (koodai), about 20 cm high. To support a round begging bowl on the altar, so that it does not topple over. It has a wide rim, short body and one shoulder. It is just a little smaller than the corresponding begging bowl. Bronze, iron, ivory, horn, pottery, stone, bamboo or wood, sometimes with a laquer finish. In Kamakura we could see the monks from the great Zen temples often, walking in the neighbourhood, chanting sutras in front of a home and waiting for a while. If they did not get an offering, they would bow quietly and walk over to the next. At the exit of the station, they would stand all day almost motionless and hold the begging bowl in their hands. If they got an offering, again, thay chanted the Heart Sutra and bowed deeply. In many Asian customs it is a much more common sight. The perishable food must be eaten on this day before noon, since monks are not allowed to eat after midday and can not keep food in the heat. They also get cloths and other necessities on their begging trip.
. . . CLICK here for TAKUHATSU Photos ! Some of the Japanese monasteries still send out their monks to beg in the streets on a monthly or weekly schedule , and I had found it an important practice to me when I was in Japan...more in harmony with my spirit then sitting still endless hours ..
. . . CLICK here for UNSUI Photos ! Unsui (Japanese: 雲水), or kōun ryūsui (行雲流水) in full, is a term specific to Zen Buddhism which denotes a postulant awaiting acceptance into a monastery or a novice monk who has undertaken Zen training. Sometimes they will travel from monastery to monastery (angya) on a pilgrimage to find the appropriate Zen master to study with. "To drift like clouds and flow like water." Helen J. Baroni writes, "The term can be applied more broadly for any practitioner of Zen, since followers of Zen attempt to move freely through life, without the constraints and limitations of attachment, like free-floating clouds or flowing water." According to author James Ishmael Ford, "In Japan, one receives unsui ordination at the beginning of formal ordained practice, and this is often perceived as 'novice ordination.'" .komusoo 虚無僧 Komuso wandering begging monks . 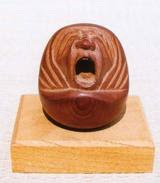 Himalayan Singing Bowls are a different matter. Our friend Geert Verbeke has written a book about it. He explains almost anything you would like to know in alphabetical order. Most of the information quoted above is from my book on Buddhist Ritual Tools. Rotsu had left his bag with a set of five bowls at a lodging in Osaka. The proprietor of the inn delivered it seven years later to Awazu (Shiga) and its owner was overjoyed. When Basho heard this story, he wrote this hokku. It is a rare story of kindness and goodwill, even at the time of Basho. The cut marker YA is in the middle of line 1. The kigo here is suzuharai 煤払ひ wiping of the soot for New Year preparations.
. - Yasomura Rotsuu 八十村路通 Rotsu - .
. gooshi, gōshi- goosu 合子 incense container . Thanks a lot for this wonderful pictures and informations. I have learned to use Oryoki by a sesshin with Kobun Chino Roshi, but I must say, that I have forgotten the right form. The Pictures from Sogenji enjoyed me too, because I will meet Shodo Harada Roshi in June 2005 in Germany. Many heartly thanks to you for this wonderful work. Thank you, Mario, for bringing this to my attention.